Waddah Saleh, 24, imam at the Abdullah Quilliam mosque in Liverpool. Photographed at the mosque’s entrance in January 2018. 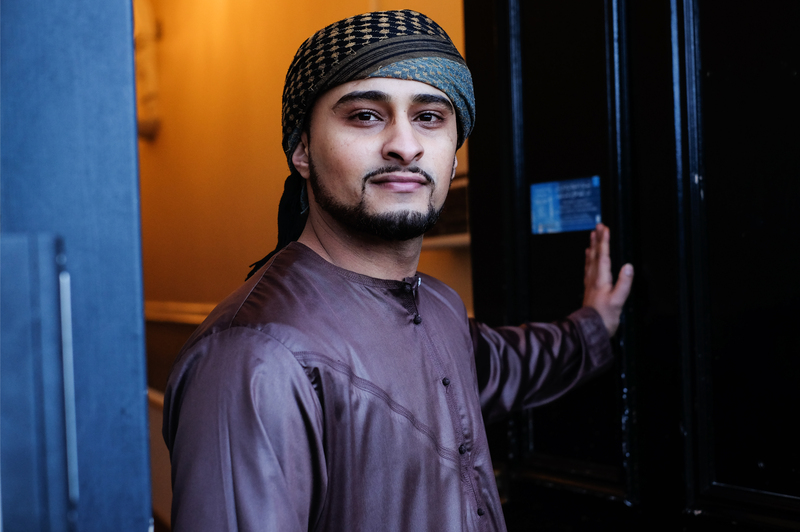 “I was born in Yemen but me and my mum came here when I was three, to join my dad. He worked in the local cornershop. I’ve spent all my life in Liverpool and I’m part of Liverpool, part of this community. When you’re based in your community, you’re able to find the people who need you. Some of the people in this area are asylum seekers from countries like Eritrea and Sudan. When they come to the mosque, they find comfort – people gather and you feel like a family. All the children here come and talk to me. When the imam is young, they can relate. When I’m with my friends, we play football, go for a meal, go for a walk – the same things as everyone else. I’ve got non-Muslim friends too, who I’ve grown up with, lived on the same street. They laugh about what the media says about Muslims.